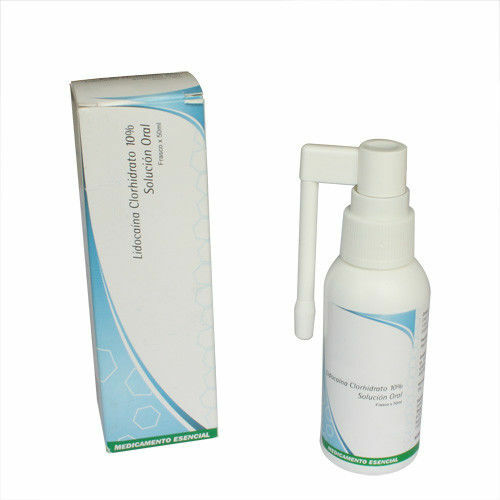 Lidocaine spray is used to numb the lining of the mouth and throat before certain medical procedure (e.g., intubation). It is a local anesthetic that starts to numb the lining of the mouth and throat 1-2 minutes after application. It also helps prevent the urge to close the throat (gag reflex), which might make the procedure more difficult. This medication is usually sprayed within the mouth by a health care professional immediately before your procedure.This medication numbs the nose and throat. This will make swallowing difficult and increase your risk of choking or swallowing the wrong way. Do not eat or chew gum for 1 hour after this product is used or until your mouth/throat is no longer numb. It is especially important to make sure children do not eat or chew gum for at least 1 hour after their procedures. Be careful not to accidentally bite your tongue or mouth. Mild nausea, stinging, swelling, and burning may occur. Dizziness and drowsiness may also occur. If these effects persist or worsen, notify your doctor.Remember that your doctor has prescribed this medication because he or she has judged that the benefit to you is greater than the risk of side effects. Many people using this medication do not have serious side effects.Seek immediate medical attention if any of these rare but serious side effects occur: slow/shallow breathing, slow/irregular heartbeat, mental/mood changes (e.g., severe drowsiness, confusion, nervousness), seizures, fainting, vision changes (e.g., double or blurred vision).A very serious allergic reaction to this drug is rare. However, seek immediate medical attention if you notice any of the following symptoms of a serious allergic reaction: rash, itching/swelling (especially of the face/tongue/throat), severe dizziness, trouble breathing.This is not a complete list of possible side effects. If you notice other effects not listed above, contact your doctor or pharmacist.